Ryan Giggs admitted having a sleepless night before leading Manchester United to their biggest Premier League win of the season at Old Trafford on his managerial debut. And despite Louis van Gaal believing he has already agreed a deal to be United’s next permanent manager, Wayne Rooney backed Giggs’s candidacy, saying he had the ‘credentials’ to keep the job next season. Giggs helped the feelgood factor return to Old Trafford with a 4-0 win over Norwich and was given a hero’s welcome and a hug from United mascot Fred the Red as he walked out to take his place in the dug-out five days after the sacking of David Moyes. The 40-year-old, who made his debut in 1991 before one of his players, Phil Jones, was even born, admitted he had been awake all night on Friday agonising what team to pick. ‘I didn’t sleep last night, not a wink,’ he said. ‘Just leaving out players was the reason I didn’t sleep. It wasn’t nice, I’ve never had to do it before. And I’ll continue not to enjoy it. Giggs picked an attacking side and was rewarded when Rooney’s penalty gave United a half-time lead. Then Rooney again and a double from substitute Juan Mata completed a win that keeps United’s European hopes alive. Van Gaal is the favourite to succeed Moyes next season, though United insist they have a number of candidates. Giggs himself isn’t on the club’s shortlist but Rooney indicated the players would be happy if the Welshman was chosen to stay on. ‘That is down to the board, obviously,’ said Rooney. 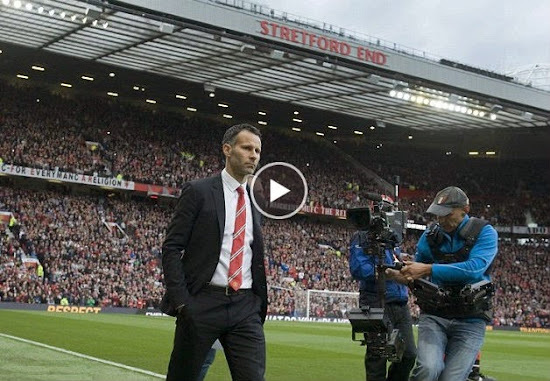 ‘Giggsy has all the credentials to be the next boss but it’s down to the board. ‘He is built to be a manager, we’ve seen that by the way he has handled himself since he took over. It was fantastic to go and get a win for him. It was great for him — he’s a natural. ‘He worked under Sir Alex for many years, I am sure he will bring that to the job. We knew it was going to be a tough game, Norwich are fighting for survival, but thankfully we got four goals and a comfortable win. ‘We’re the ones on the pitch, we have to take a lot of responsibility [for Moyes leaving]. Rooney was also full of praise for Giggs’s impact on the team since taking charge, saying: ‘Giggsy has come in, he’s a really experienced player and he’s built to be a manager. Mata started the match on the substitutes’ bench but was delighted to be given his chance to make his mark in United’s much-improved second-half display. ‘The first half was difficult but in the second half we showed what Manchester United can do at home,’ he said. ‘We always try our best. Sometimes it’s difficult to win, it’s difficult to play.